only not as nice as either of these. I’m particular about light. I don’t like direct light unless I’m working, and I don’t like light that’s the wrong color. I’m never going to adopt CFLs, I’m sorry to say. I like warm and clean light that bounces off walls and ceilings before it gets to me. I think bad lighting can ruin an otherwise nice room. Anyway, I’m particular. And especially particular about bedroom light. 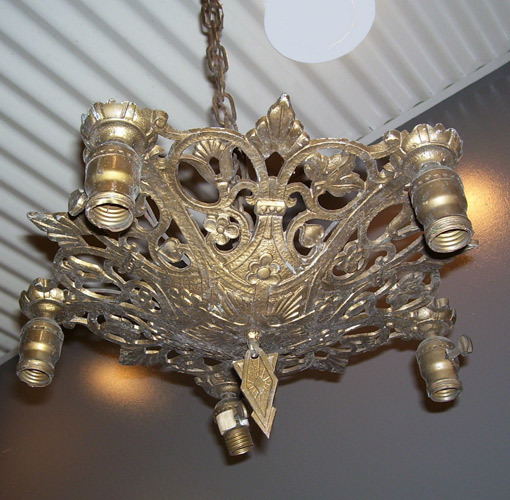 The other thing I realized is that although this 20s-30s style of chandelier is pretty, and plentiful on ebay, it’s a major direct-light offender. Which is fine in the office with some old-style bulbs that are interesting to look at, but not what I want for tranquil bedroom light. I saw this unusual light on ebay. 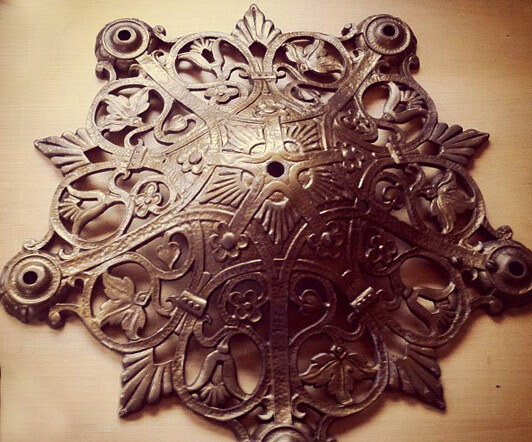 Kind of like an old theatre lobby light made of bronze (possibly brass) and mica (listed as islinglass). It wasn’t exactly what I wanted, but it was interesting enough that I bid – I figured I could update it. The auction went over what I wanted to pay for it, and that’s okay. But it gave me an idea and I kept looking. Yes, it’s another one of those same direct-light fixtures, but you can probably see where I’m going with this. It’s getting a revamp. This week I’m going to paint it and get wiring for it and some other supplies I’ll need. 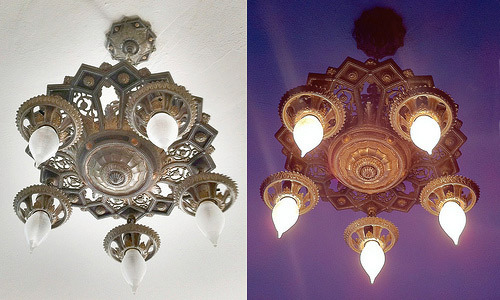 I’ll do a whole post on the restoration and explain how (with any luck) I’m going to turn it into a softer uplight fixture – It’s an experiment! Hey… I think I won that contest about the chandelier. bedroom lighting.. Go simple and something that closes to the ceiling. . No bugs..
You’ll see what I have in mind! Maybe it’ll work, maybe it won’t. At least it’s keeping me busy while I’m sick.